I have been baking eggless cakes using Yogurt/ Dahi [Indian curd] as an egg substitute and been getting good results. This time decided to use apple sauce. I read somewhere that apple sauce not only replaces eggs also fat. Looks like this is true, this time I used just half amount of vegetable oil . My cake was super moist too, do you think its because of apple sauce? Now coming to the corn flour...I used Bob's Red Mill 100% stone ground whole grain cornflour. I combined with equal parts of unbleached whole wheat flour. I noticed cornflour adds slight gritty texture to the cake. This is my first time baking corn cake, wasn't sure of the cornflour-whole wheat ratio, just decided to try half and half and it worked. Fold in the dry ingredients and blend again for 1/2 minute. *I used 2/3 cups of table sugar and the muffins were on the sweeter side. I think half cup of table sugar would have been enough to provide the required sweetness. The batter rose quite quickly unlike in the past. I wasn't sure of getting the structure, but to my surprise muffins had nice crumbly structure, however they were more moist than regular muffins. I am thinking the extra moistness was due the the juices of strawberry in the batter. Wow that really good one.. Looks so good and perfectly raised. Wish to grab one from the screen. Wow beautiful muffins, looks prefect and cute.. Your muffins look wonderful , I havnt tried apple sauce in cooking before but will try it for sure.Your pictures are wonderful. They look really gorgeous dear....yummy..
Looks great n perfect. Thank you for participating in the event. Nice snap. You always come up with a new baking experiment n surprise us...keep up the gud work. First time to ur blog space and loved it. You have interesting and tasty recipes. Perfect muffins. Following u.
thank you all for your wonderful comments ! i also wanted to try eggless version for a while.but after looking at your muffins i am more tempted to try now..
Hi Renu, the muffins look perfect. I had read somewhere that applesauce is used as an egg replacer but have not used it personally. my doubt or rather my question to u is can we use corn meal instead of cornflour. We get white coloured cornflour here...so got very confused. 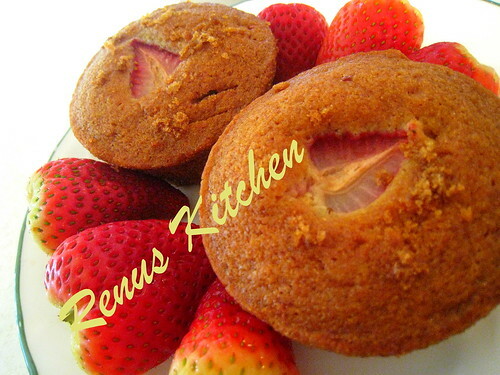 Renu, that's such a beautiful shot of the muffins. Great job. Thanks for sending it to the event. I think in the notes section you meant to say that brown sugar is sweeter than white. they look delicious!! never had cornflour muffins..
regarding cabbage parathas, i fried the cabbage in oil for about 3 minutes so that they turn soft. i think you missed reading it. Wow your muffins have baked beautifully! It was a pleasure browsing your site. Can you please provide me more details on Bleached whole wheat flour. I found the Corn flour ar Wegmans.But I was not sure where to buy CF. I have tried ur recipe and the muffins are indeed wonderful. I have posted the link of this recipe on my blog. I hope you dont mind.